After discovering Pinterest, a photo sharing website where you can share and get ideas from other Pinterest users, I became inspired to become very creative with the Halloween food at our annual Halloween party, as did a lot of our guests who brought potluck contributions. Probably the food item I was happiest with creating this year was my watermelon brain. This was very easy to do. First, cut part of the underside of the watermelon flat so that the “brain” will not roll around and will sit nicely. Next, take a vegetable peeler and peel the green outer coating of the watermelon off so you are left with the white inner part. Take a paring knife and cut down the middle of the watermelon (to create the division between the left and right sides of the brain). With the paring knife, cut out sections to make squiggly designs, being careful to remove just the white part so you can see the red underneath. Voila! 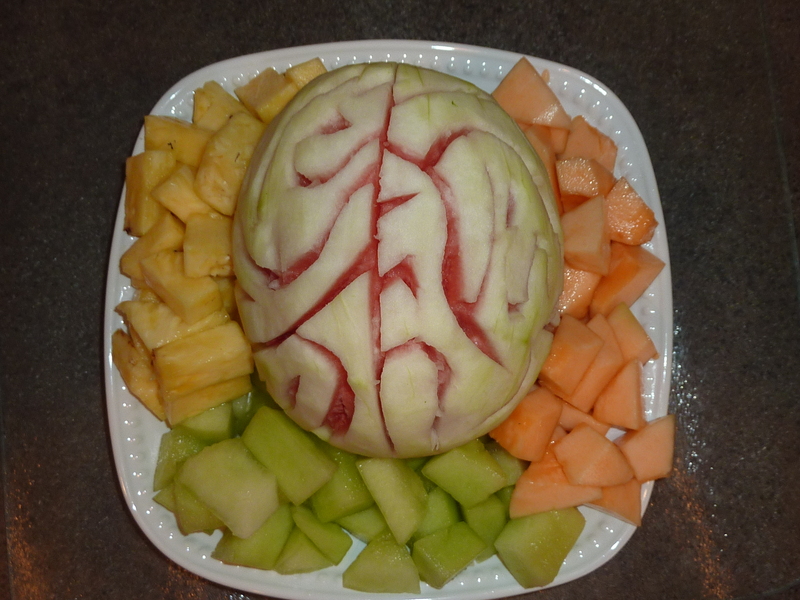 Watermelon brain! I used Wilton’s orange food coloring gel to give color to this white cake. 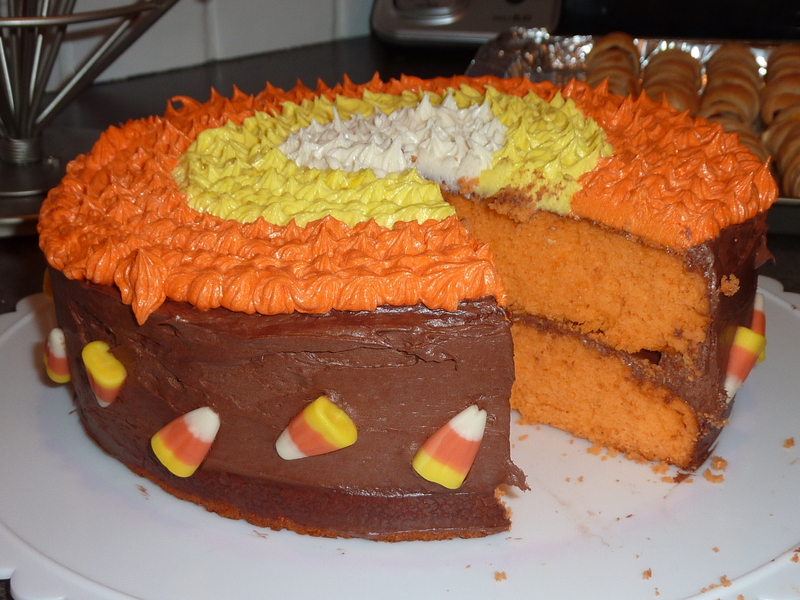 My only regret with this case was that I didn’t look at candy corn before I decorated it and I mixed up the order of the yellow and orange colors, but live and learn. Decorated with chocolate cake around the edges and tinted vanilla icing on the top, this cake was very tasty! My initial plan was to make marshmallow Frankensteins, but I could not find green color mist, so I improvised and make some ghosts instead. 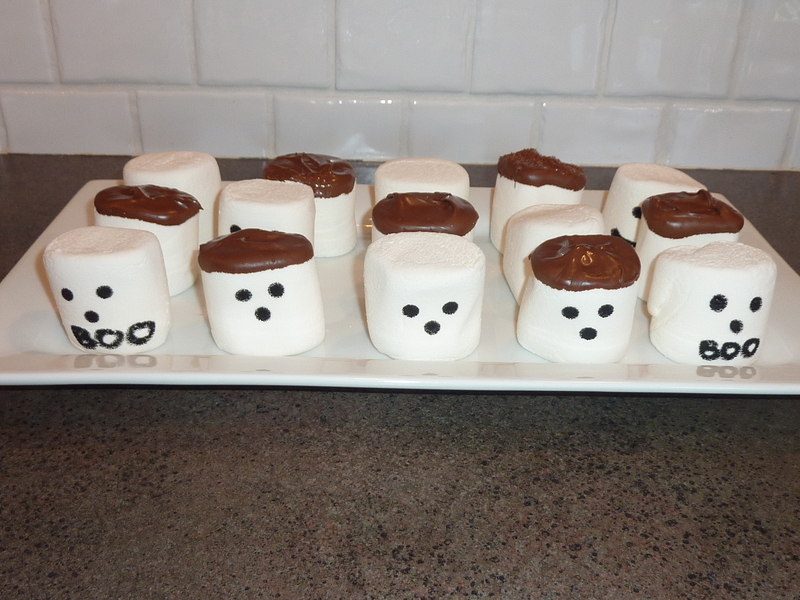 Using Wilton’s edible markers for the faces and chocolate candy melts for the hair, the kids really enjoyed these!